On Saturday I had the rare experience of having to walk just a few hundred yards from home to deliver a 1 day workshop on consensus decision making to the good folk of Transition Leicester. We met in the Friends Meeting House (well-priced, good access, well equipped kitchen, lovely garden). The group was wide-ranging in it’s experience of doing consensus (from 25 years of working in housing co-ops to never having come across consensus before) but had a sophisticated understanding of what consensus could and should be. Some of them were from the Transition Leicester steering group. Others, like me, are on the periphery of the movement and had an interest in using consensus in other areas of their life – for example at work and in other voluntary groups. My plan was to cover the ‘how does it work’ side of consensus and still dedicate a considerable amount of time to the underlying ethos – the values, the states of mind without which consensus can’t flourish. To that end I picked up on some of the activities I used at Consensus: in at the deep end workshop in October – activities that encourage the exploration of different positions, empathy, deep listening and deep understanding. I added a new exercise to help explore the different shades of agreement that exist within consensus: what does it feel like to have a strong personal opinion or concern and to put it aside for the benefit of the group as a whole? It was a reflective pair exercise with one partner supporting the other through a series of reflections (or for some, imaginings). Judging from my observations on the day, and from the feedback, there’s room for improvement. Not everyone was able to engage with the style of exercise, and it’s a little too complex. It would benefit greatly from a demonstration. But for me it’s an exciting development, and one I’ll keep playing with. 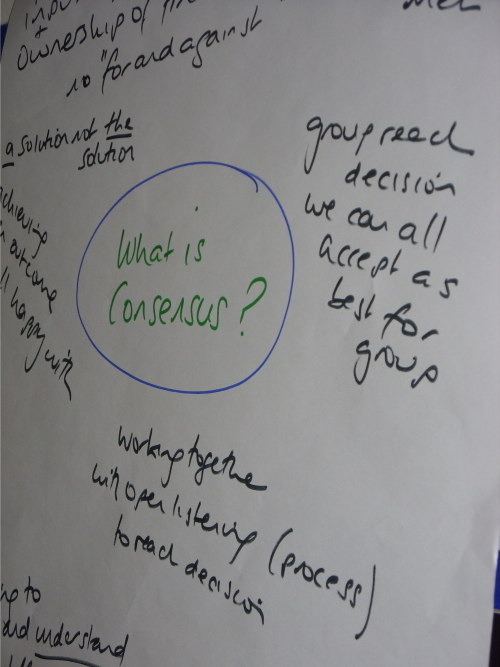 About half of the group expressed an interest in more work on consensus – particularly with a focus on facilitating it. I’ll be contacting them in the next few days to see when and what format of workshop would work for them.